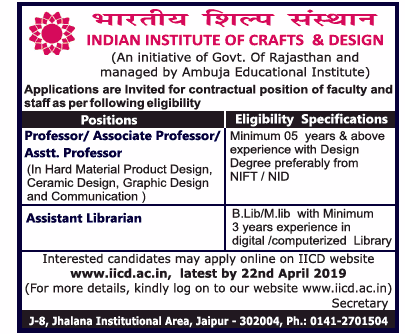 Indian Institute of Crafts and Design, Jaipur has advertised in THE TIMES OF INDIA newspaper for recruitment of Professor / Associate Professor / Assistant Professor / Assistant Librarian jobs vacancies. Interested and eligible job aspirants are requested to apply on or before 22nd April 2019. Check out further more details below. About College: Indian Institute of Crafts & Design, Jaipur, is one of the leading crafts and design colleges in India that work towards the evolution of crafts and the artisans in the contemporary socio-economic context. IICD is uniquely positioned and offers undergraduate and postgraduate degree programmes in the field of crafts & design. These programmes provide student with the means to grow as sensitive, creative designers and practitioners of craft with clear goals to contribute towards Indian culture and society as a global citizen. One of the top-notch crafts and design colleges in India, IICD teaches with a unique pedagogy that synergizes traditional knowledge and skills with contemporary methodologies. The institute offers conducive environment for project & consultancy on revenue sharing basis, higher studies and research etc. Annual Increment as per the existing policy of the Institute will be given to the selected candidate for the above positions. Medical Insurance up to Rs. 2.00 lac. 30 days leave per year. Provident fund facility as applicable at IICD. Medical reimbursement facility as applicable at IICD.